As a child, I found cooking completely uninteresting. However, there was one little recipe that was easy enough to cobble together, whimsical enough to hold my attention and satisfying enough to warrant the effort. Bird’s Nest Cookies are perfect starter cookies to bring out the baking-cooking spirit in reluctant budding chefs. Just a little note of warning—you will enjoy this cookie enough to go to sleep dreaming up alternate fillings. 1/2 c jam: apricot, strawberry, cherry, prune, raspberry, coconut, etc. Combine all ingredients except for the jam in a large bowl. Form the dough into 1-inch sized rounds. 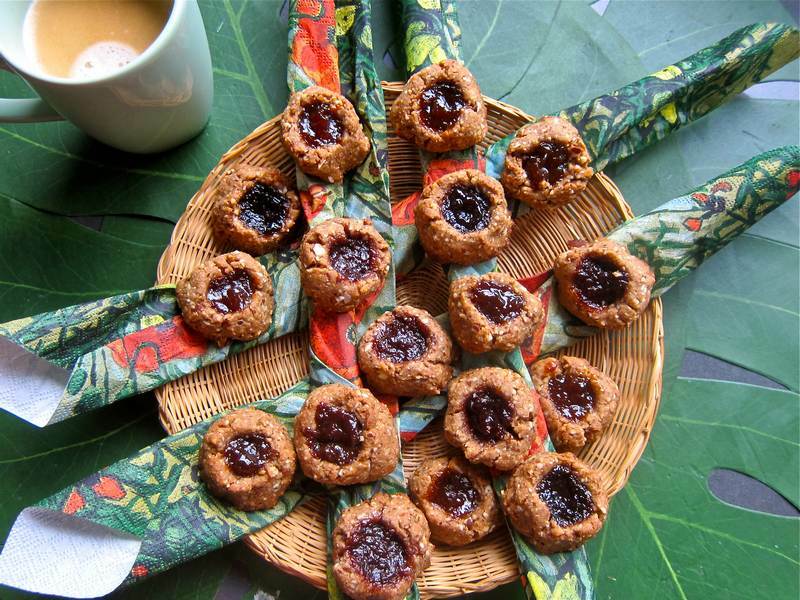 Space them out on a cookie sheet, and in each cookie, make a thumbprint large enough to hold a heaping 1/2 teaspoon of jam. 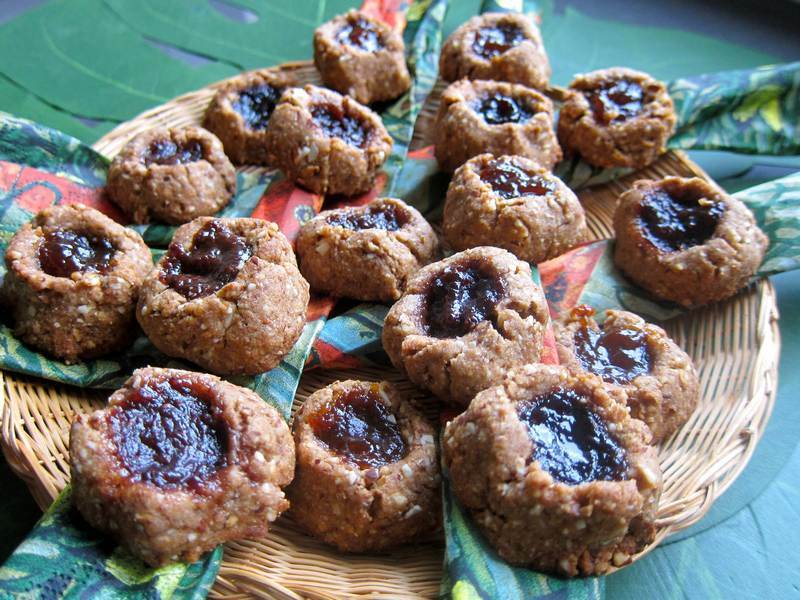 Fill each cookie with assorted jams. Bake for 18 minutes or until golden brown. Cool before eating or the hot jam may burn you. Yields: 2-3 dozen cookies. Made this recipe three times recently. Tried apricot, strawberry and cherry jams from Sublime Flavors and they were all wonderful. The Pineapple Coconut Jam and the Vanilla Coconut Jam were both excellent. Looking forward to trying the Chocolate Coconut Jam and the Guava Coconut Jam in the next batch. 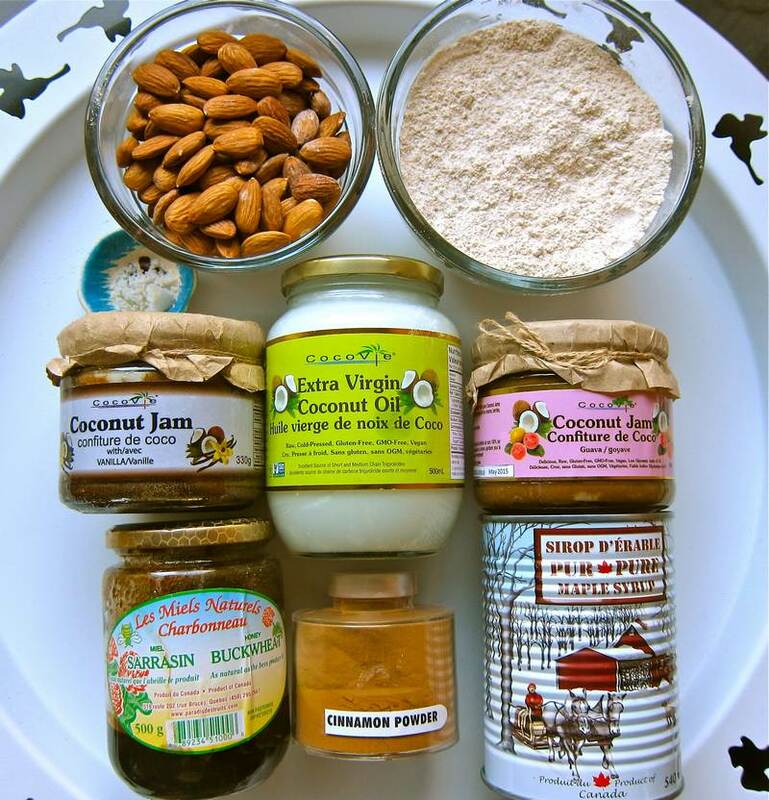 Cocovie coconut jams, coconut oil and other coconut products are finally available in the Montreal area at all locations of Avril Supermarche Sante. Here’s a good reason to stuff these New Age Bird’s Nest with chocolate. Did you know that cacao nibs are even better for you than dark chocolate. While we’re on the topic of the birds and the bees, have you heard about the 40 day dating challenge? After treating yourself take a look at these 7 pieces of fitness advice that you’ll really want to follow. They are yummy. I made them three times recently due to high demand. New Age Rustic – that’s a new category! My pleasure. Your snickerdoodle cookies look delish. Can you tell I’m starving…..Thank you Ms. Holly aka The Jittery Cook.